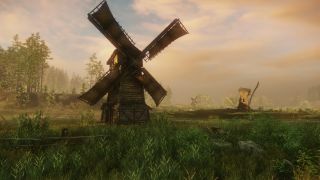 Amazon has released another set of images from its upcoming player-driven MMO New World. Revealed on Twitter as part of the #screenshotsaturday hashtag, the images provide a further glimpse of the detailed environments Amazon is trying to create. This time, the images depict a windmill, a moonlit river and, ah, a big tree. It would've been great to see a sword fight or a fortress being blown up or something, but oh well—they are at least pretty. Amazon put out a similar batch of screenshots last week, which also included a neat time-lapse video showing off the day/night cycle. In addition to the new screens, Amazon has put out another call for people interested in the game to sign-up for alpha testing. To do this, you need to visit the game's website and click the “Alpha Sign Up” button. From there, you login to your Amazon account and click “Email me”. If you’re accepted into the Alpha Testing program, Amazon will notify you with details at some point down the line. In the meantime, have a look at the latest batch of images below.